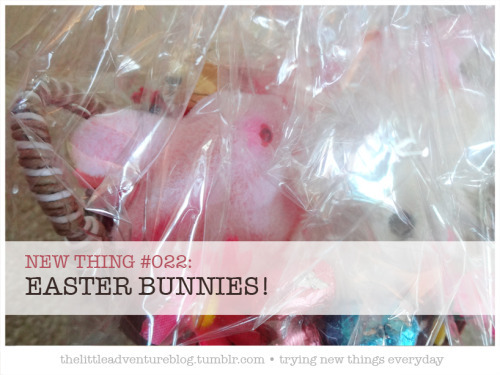 NEW THING #022: Easter bunnies! So my little sister (8 year old) organized this little easter egg hunt for the family lol. She made the eggs and clues and hid them all by herself, and made it kind of a scavenger hunt type thing with clues and stuff. And she made a little prize for us too, with a bunch of cute bunnies and candy/chocolate treats all wrapped up nicely in a basket (pictured above). We kept finding little bunnies everywhere that day.